This year I thought I’d try my hand with digital painting, since it’s really fun to do, and a bit easier when you don’t have time or space to pull out the regular paints and brushes. 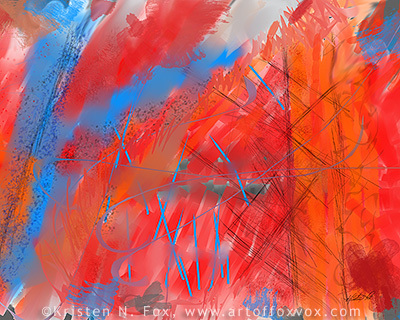 I’d heard a lot about the ArtRage program, but decided to try a freeware version first, so I downloaded MyPaint. Also dusted off the ol’ Wacom Graphire Tablet. Click on the image to see a larger version of it, or to purchase a print (sans the copyright notice along the bottom, of course), via my gallery at imagekind.com. Beautiful! It’s vivid, it has wonderful contrasts between the sharp lines and the fullness of the large color splashes. I wish I could see it huge to really enjoy getting into those little spaces. Thanks, Dano – what a review!!! 🙂 And I also have to thank you for pointing me in the direction of digital painting in the first place. I may eventually get ArtRage even. 🙂 Yer da best.